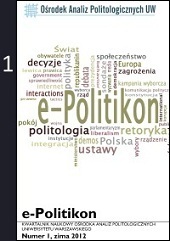 We are very pleased to announce that Center for Political Analysis of University of Warsaw begins publishing political science quarterly “e-Politikon”. The purpose of our project is to create a mainstream platform for discussion and analysis of political science, exchange of ideas, as well as a space for the publication of research results. We would like to invite representatives of political science centers both the Polish and foreign. Our journal will be publish in electronic form only and will be freely available for all subscribers or everyone concerned who will be able to download from the website of the Center, www.oapuw.pl. We invite you to submit a proposal for articles which covers five areas of research on which the Center for Political Analysis is focused: The Quality of Governance, Civil Society, European Integration, Present-day Challenges and Dangers, International Relations and Political Communication. Please read the instructions for Authors and send proposed texts for address: epolitikon@oapuw.pl.